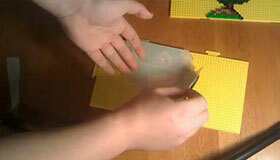 Perler beads (as known as Hama beads or Nabbi beads) are plastic fusible beads. These colorful beads are usually arranged on plastic pegboards to form patterns and then fused together with a clothes iron. They can also be strung into necklaces, woven into keychains, or even assembled into three-dimensional decors. 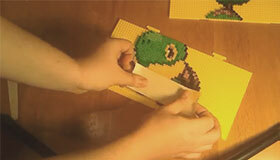 Crafting Perler beads is a fun and inexpensive art form that inspires creativity. It can also help young children develop hand-eye coordination skills and learn color names and basic counting. 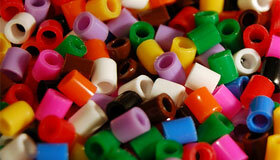 Fuse beads are made of low-density polyethylene (LDPE), a food-grade plastic. They don't contain harmful chemicals. The most common bead size is 5mm in diameter, suitable for both adults and children. For very young children around three years old, there're large beads for sale with a 10mm diameter called Biggie Beads (Perler), Maxi Beads (Hama), or Jumbo Beads (Nabbi). Hama also manufactures a type of very small, 2.5mm beads branded as Mini Beads, but they are far less popular than the medium-sized ones. 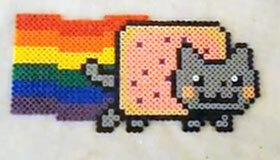 Perler beads come in solid colors, translucent colors, glitters, and glow-in-the-dark variants. For beginners, we recommend that you buy a small bag of sorted beads(e.g. Perler Tray Of 4000 Beads With Idea Book ) to get a feel for the craft before stocking up on more colors. The optimal bead inventory depends on the designs you choose. Generally speaking, you will need a lot of black (for outlines and shades) and white (for highlights and backgrounds). In comparison, glitter and glow-in-the-dark beads are not very useful in practice. Don't bother buying them when you're just getting started. You might be tempted to buy those bead jars with mixed colors as the unit cost is cheaper and they offer a wide variety of color choices. Please be aware that you almost always need to sort the beads first which is quite time-consuming. Pegboards have various geometric shapes. 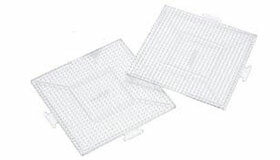 We recommend that you buy a pack of interlinkable, transparent square pegboards , each with 29-by-29 pegs (841 in total). If you plan to create large designs, consider investing in a few classic superpegboards which can hold 3381 beads. Don't waste money on smaller pegboards or irregular-shaped ones. They can be useful for certain designs but are not as versatile as the standard square pegboard. 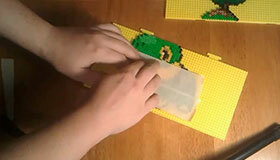 To protect your iron, always use ironing paper to cover the Perler beads. Either parchment paper or wax paper work well as reusable ironing paper. You may not need to buy them separately as some beads packages (e.g. 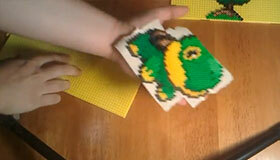 Perler Tray Of 4000 Beads With Idea Book ) already include ironing paper. First of all, find a flat surface to place beads on a pegboard. Once you're happy with the design, preheat a dry household iron to its medium or high setting. Do not add water to your iron, otherwise the steam will ruin the beads! Cover the beads with a sheet of ironing paper. Keep the iron level and slowly move it in a circular motion for about 30 seconds while pressing the beads very gently. Be careful not to bump the beads from the pegboard. It's generally a good idea to first iron those beads on the edges as they are prone to toppling over until they are melted and fused together. If some beads tip over, put away the iron immediately. Use a toothpick or tweezer to place the beads back onto the pegs. When you're done with one side, put some heavy books on top of the ironing paper to even out the surface. Without the pressure, heated beads may start warping. Wait for a minute or so. 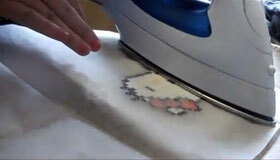 Once the beads cool off, gently peel off the ironing paper. Carefully lift the now fused beads from the pegboard and flip them over. Cover the other side with the ironing paper and iron it evenly. Don't feel bad if your initial ironing attempts end up with over-heated beads, missing pieces, or an uneven surface; just experiment with small designs first to develop your ironing skills. 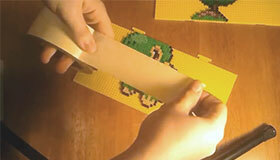 You will soon be able to create larger and more amazing Perler beads designs. Pegboards are plastic, so they may warp under iron heat and pegs can melt down if the iron gets too close. To prolong the life of your pegboards, use strips of wide masking tape to cover the beads so that you can lift them off the pegboard and flip them over. 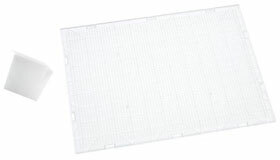 You can then lay down a sheet of ironing paper and start ironing without running the risk of destroying your pegboards.